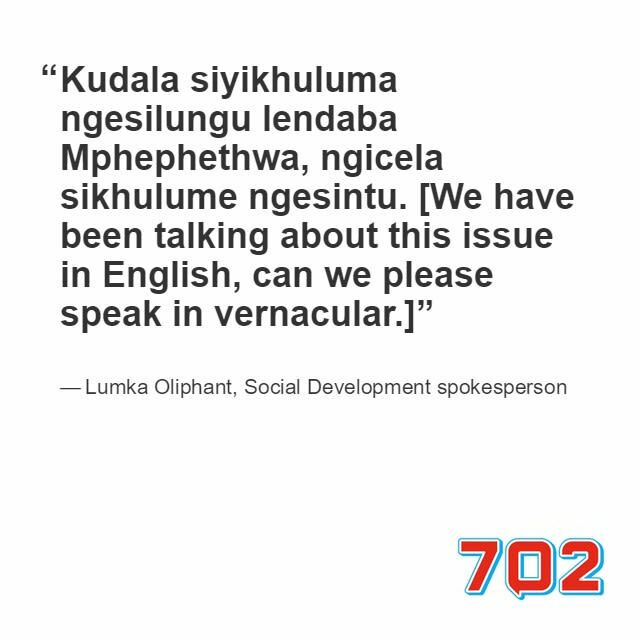 Social Development spokesperson, Lumka Oliphant refused to speak English during a scheduled interview with Xolani Gwala this morning. It's still not clear how the South Africa Social Security Agency (Sassa) will pay social grants at the beginning of April, but Cash Paymaster Services (CPS) says it has reached an agreement with Sassa. Cash Paymaster Services says it has reached an agreement with Sassa, and social grants will be paid beginning of April. Last month Sassa CEO Thokozani Magwaza wrote to Barnes asking help to fast-track a deal, now CEO Mark Barnes says SAPO can help. Cosatu put brakes on signing the R20 p/h minimum wage agreement last month but are now ready to sign under certain conditions. Social Security Agency of South Africa (Sassa) has no plan of how to pay 17 million social grant beneficiaries from 1 April. Scopa has summoned Social Development Minister Bathabile Dlamini to explain her plan to pay 17 million social grants. Opinion: Who benefits from Sassa/CPS contract saga? Yesterday Sassa withdrew its Constitutional Court application to extend its contract with CPS. Social Development Director General Zane Dangor says Sassa is locked in negotiations with CPS over a new 12-month contract. On Tuesday the agency filed for the court to approve the extension of its CPS contract but withdraw after new info came to light. The Black Sash says they it is intending to lodge an application with the courts to ensure that Sassa beneficiaries are protected. Daily Maverick's Marianne Thamm says Social Development Minister Bathabile Dlamini is not being held to account in the Sassa saga. Minister Bathabile Dlamini's spokesperson says people should stop spreading lies that minister drinks alcohol. Special advisor to Public Service Minister says Social Development needs to take action, before other department get involved. Govt spokesperson Lumka Oliphant wrote a no holds barred Facebook post defending Bathabile Dlamini who has been called a drunkard. Is it right to use SASSA for commercial gain? John Robbie explores the use of state intellectual property for commercial ends in light of a trend of luring beneficiaries into buying products with their SASSA cards. Government talks to extend child grants are surprising as there simply isn’t any money to do so, says economist Xhanti Payi.